OCEAN CITY – At Bomshell Boutique, which is located on Route 50 in West Ocean City, customers can have a glass of wine and be personally styled with affordable one-of-a-kind fashion. Bomshell Boutique Owner Gina March began her business operating from home, relying on word of mouth and social media to draw attention. Starting with a Facebook page in the summer of 2012, March envisioned building a shopping experience that would involve a few specifically selected women’s clothing lines and accessories, a limited stock and a friendly atmosphere. By February 2013, Bomshell had outgrown March’s house, prompting her to move into the Taylorville Shopping Center on Route 589. However, the location only lasted a couple of years before a snafu with the location had March looking for a new space. By the start of this year, Bomshell moved into its new and current location off of Route 50 in West Ocean City. “I can’t tell you how many new clients we have on a weekly basis because of the new location. It has been really great,” March said. “I want a girl to come in and be able to buy the shirt, the shoes and the earrings, walking out feeling like she didn’t spend her entire paycheck with us,” said Bomshell Boutique owner Gina March about her store. Last Friday, March was going back and forth between interviewing with The Dispatch and personally styling a client, after all that is what Bomshell is all about. A personal shopping experience begins at Bomshell by appointment or simply walking through the doors where you are offered coffee or wine. “When you come in, you are getting a personal experience. We work with you, and our customers become our friends. I have made tons of great relationships with people that come in here … you’re not getting that anywhere else. We are going to make you feel amazing from outside in and from the inside out,” March said. Bomshell offers high-end, one-of-kind items at affordable price points, and that is what has made the concept work so well, March stated, and when buying she makes sure the designer isn’t selling the same items to another store in the area. “There is so much great stuff out there. We live in a small town, and you don’t want everybody wearing what you have … that is what a boutique should be about,” March said. Bomshell is a full-line boutique offering everything from clothing to shoes and accessories. 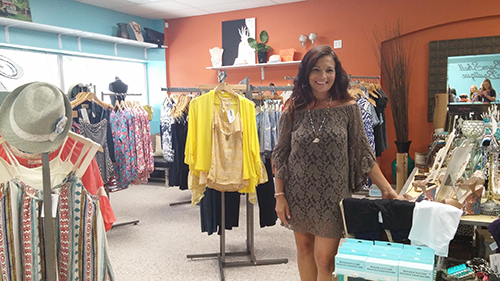 As Bomshell Boutique “is running like a well-oiled machine” on Route 50, March is looking into adding another location in the future as well as offering her personal styling services and closet organization skills in home. Bomshell Boutique is located at 12216 Ocean Gateway, Suite 1300 in West Ocean City. To see all the boutique has to offer visit their website, www.bomshellboutique.com or visit their Facebook page where it all started.